LeTourneau Baseball Falls In 12-10 In Slugfest To Wisconsin-Platteville. 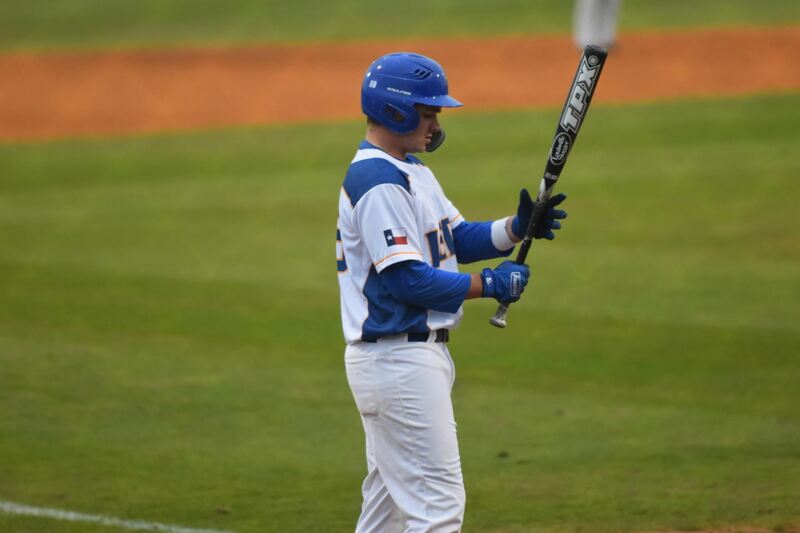 LONGVIEW, Texas – Combining for 22 runs on 23 hits, the LeTourneau University baseball team would drop a 12-10 slugfest to visiting Wisconsin-Platteville at Conrad-Vernon Field on Monday, March 18. The loss drops LETU to 13-7 overall and snaps an eight-game win streak while the Pioneers improved to 3-6 overall after splitting their past four games. UW-Platteville would waste no time getting out to an early lead as the first four batters of the game would safely reach base. In total, the Pioneers would collect four hits in the top of the first (all singles) to score four runs to hold a 4-0 lead after one inning of play. LeTourneau would be sparked by a five-run bottom of the second inning to claim their first lead of the night as Noah Mahoney and Cody Lee would get the inning started with back-to-back singles. An infield single by Jacob Faubion would deliver as a throwing error allowed both Mahoney and Lee to score before Eli Birriel would drive Faubion home. A Lee Hosie triple down the right-field line and Matt Lowery single down the left field line would end up bringing across the plate the final two runs of the inning as a wild six-hit, five-run inning put things at 5-4 going to the third. Following a scoreless third, LETU would continue to lock down on defense and hold the Pioneers without a run in the fourth before adding some insurance run on a towering two-out home run by Bryce Brueggemeyer to make the score 7-4. A single run by the YellowJackets in the bottom of the fifth pushed the lead to 8-4, but it would be Wisconsin-Platteville that would break through with a five-run top of the sixth inning as four hits, one walk, and a wild pitch allowed the Pioneers to go back on top by a score of 9-8. The back-and-forth continued in the bottom of the seventh as LETU would get a Hosie sacrifice fly to score Faubion who would get on base via a walk to lead off the inning and reclaim the lead on a Lowery sacrifice fly to score Birriel. Wisconsin-Platteville would push across a single run in the top of the eighth by taking advantage of a YellowJacket error to knot things at 10-10 and escape a two-out jam in the bottom half of the inning as LETU would load the bases before coming up empty. It would be the Pioneers who would then break through in the ninth inning to put their leadoff man aboard and wind up scoring two runs on three hits and another LeTourneau error to go up 12-10 before shutting down the YellowJacket offense to end the game. Four of LETU’s 11 hits would come from the top three spots in the lineup as Lowery, Mahoney, and McKinley would each deliver two hits. Stranded runners proved to be an issue for the YellowJackets as 12 total runners would get left on base to go along with nine strikeouts by LeTourneau batters. Non-conference play continues for the YellowJackets with a three-game series at the University of Texas-Tyler beginning on Friday, March 22 at 7:00 p.m. The Patriots are in their final season as an NCAA Division III institution and are the reigning national champions. 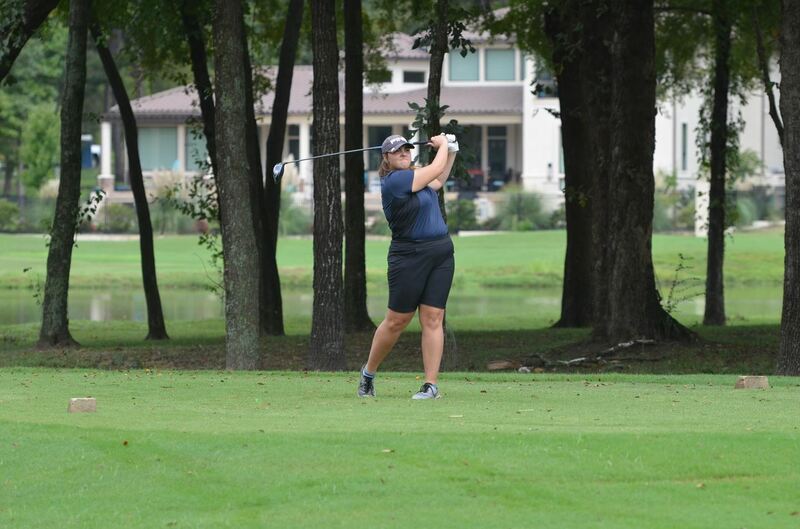 LeTourneau Women’s Golf Competes At Hal Sutton Invitational. BOSSIER CITY, La. – Returning to action following a week off for spring break, the LeTourneau University women’s golf team would compete as part of the seven-team, 38-individual Hal Sutton Invitational at the Golf Club at StoneBridge in Bossier City, Louisiana on Monday, March 18. With three individuals competing in the event, LETU would be led by freshman Baylee Van Houten who would post an opening round 87 to sit in a tie for ninth place while Rachael Green shot a 95 and is tied for 24th heading into tomorrow’s final round. Brittany Taylor would also compete on Monday for the YellowJackets and sits in 31st place overall following an opening-round 101. Action will get underway again tomorrow morning with final round action to close out the first of two meets this week for LeTourneau. Leigh Luker Named ASC Softball Pitcher of the Week. 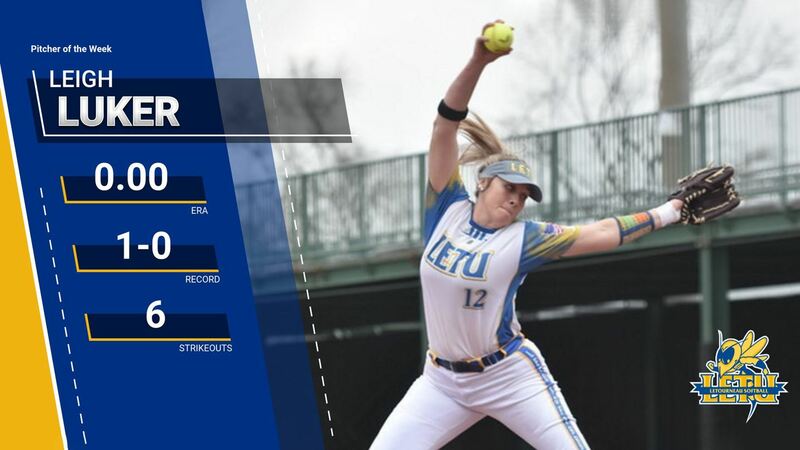 RICHARDSON, Texas- For the first time in her career, LeTourneau University junior softball player Leigh Luker has been named American Southwest Conference Pitcher of the Week for her performance against Belhaven University during the week of March 11-17. Luker led the YellowJackets to a 6-0 victory in game two of a three-game series against the Blazers with complete game performance. The Huntsville, Texas native held the Blazer offense to a .125 batting average and allowed just three hits through seven shutout innings. Luker ended the week with 0.00 ERA while adding six strikeouts in the contest and no walks. Luker is the daughter of Brenda and Darrel Luker and is majoring in education with a minor in Kinesiology at LeTourneau University. LeTourneau Baseball Grabs 7-0 Shutout Win Over Wartburg On Sunday Afternoon. LONGVIEW, Texas- Riding a seven-game win streak, the LeTourneau University baseball team looked to extend their success as they took an early lead and didn’t let up in a 7-0 victory over Wartburg College at Conrad-Vernon Field on Sunday, March 17. The victory extends the YellowJackets win streak to seven straight as they improve to 13-6 overall while Wartburg drops to 2-9 on the season. The opening two innings of play were quiet for both squads until the Knights posted the first threat of the game before stranding two runners in the top of the third. Eli Birriel would break through for the YellowJackets in the bottom half of the third with an RBI single to left field to bring across Weston McKinley as Lee Hosie followed to bring home Birriel off a Wartburg error to make it 2-0. The YellowJackets tacked on two more in the fourth with the help of another Wartburg error and RBI groundout from Cody Lee to score Jacob Jones from third base as the YellowJackets headed into the fifth holding a 4-0 lead. The LETU offense didn’t stop there as Jones, and Noah Mahoney both reached base to start the eighth inning. Lee grabbed his second RBI of the contest when he slammed a single through the left side to score Jones. With two outs in the frame, Birriell struck again with a two-RBI single to left field to increase the LETU lead to 7-0. The Knights saw a single base hit in their final attempt in the top of the ninth as they ended the contest stranding one runner as part of offensive struggles that lasted throughout the game. Freshman Raul Martinez earned the win on the mound for the YellowJackets, tossing seven shutout innings while giving up just six hits and striking out three batters. Taking over in the seventh, Kolton Eberlan allowed only a two-hit two-inning. The Knights outhit LETU 8-7 as just one YellowJacket saw a multi-hit game when Birriel recorded a team-high two hits and three RBI. Five other LETU batters would collect one single each with Lee also adding two RBI. LETU will return to action for the third consecutive day as they face Wisconsin-Platteville on Monday, March 18 at 7:00 pm. The Pioneers will enter Monday’s matchup with a 2-6 overall record and are coming off two straight losses against Texas Lutheran University. LeTourneau Baseball Runs Win Streak To Seven With Doubleheader Sweep of Wartburg. LONGVIEW, Texas – Scrapping out a 2-1 seven-inning victory in game one, the LeTourneau University baseball team would break open 3-1 deficit with a five-run sixth-inning game two to come away with a 7-3 win to earn a doubleheader sweep of visiting Wartburg College at Conrad-Vernon Field on Saturday, March 16. Winners of seven-straight, LETU is now 12-6 overall while the Knights fall to 2-8 overall. Hits would be few and far in between for both squads in the seven-inning opener as the YellowJackets would use a hit batter and Bryce Brueggemeyer sacrifice fly to get on the board to take a 1-0 lead after one inning of play. Each team would end up stranding runners in the second frame and would be unable to put together any type of offensive rhythm until the late stages of the game. With LeTourneau still holding a 1-0 lead going to the top of the sixth, Wartburg would use a one-out single along with a throwing error and passed the ball to put the game-tying run just 90 feet away from scoring. An RBI-single would tie things at 1-1 with only one out and would be followed up by two more singles to load the bases and force a YellowJacket pitching change. The call to the bullpen would be just what the doctor ordered for LETU as a strikeout and fielder’s choice would end the inning with the bases still loaded and no more runs coming across for the Knights to leave things knotted at 1-1. Wanting to reclaim the lead in the sixth and avoid having to play the bottom of the seventh, LETU would get an infield single by junior Brandon Ramirez as a throwing error on the play would allow him to move to second. Following a strikeout and back-to-back walks, LeTourneau would push across a go-ahead run on a bases-loaded balk to score pinch-runner Mark Sanders before seeing their half of the inning ended with the bases loaded similarly to Wartburg. LETU would look to be on their way to quickly ending things with two outs from the first two batters of the inning but would have to work around a fielding error and stolen base by getting a game-ending groundout to come away with a series-opening win. 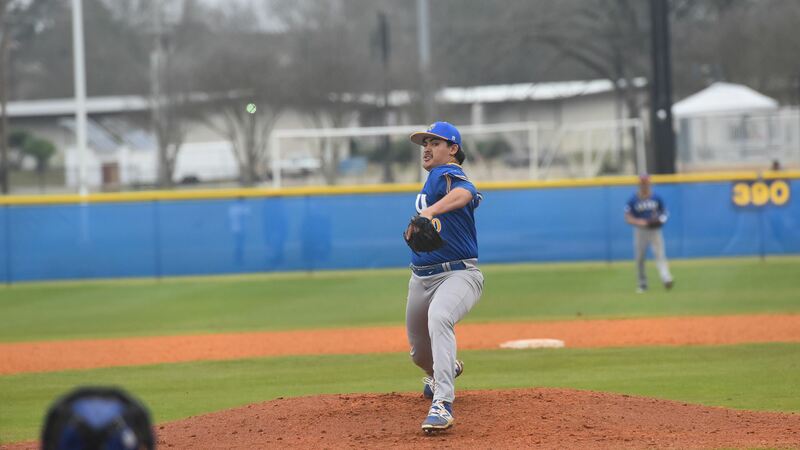 LeTourneau starting pitcher Andrew Harlan would go 5.1 innings strong and allow just one run on seven hits while striking out seven, but it would be sophomore Kolton Eberlan who would pick up his second victory of the year to improve to 2-2. Eberlan would throw the final 1.2 innings of play and strike out one while not allowing a hit to any of the six batters he faced. Two of LETU’s three hits in the game would come from Jacob Jones, with Ramirez collecting the lone another YellowJacket hit. LeTourneau would manage to draw seven free passes in the game which would prove to be just enough offense to earn the victory. A similar start to game two would find offense once again hard to come by as neither team would break through in the first three innings of play. With the game still scoreless going to the top of the fourth, Wartburg would put together a one-out rally to score three runs on three hits and a costly LeTourneau error as only one of the three runs would be earned. The YellowJackets would get a run back in the bottom half of the fourth as a Jones leadoff single would allow for a passed ball and stolen base to put LETU’s first run of the game in prime scoring position before a delayed steal by Matt Lowery allowed the runner to score. A hitless fifth inning along with a one-two-three top of the sixth brought LETU back up to the plate trailing by two with Jones once again leading off the inning. It would be the YellowJackets who would put together a one-out rally and take advantage of a Knight error as LeTourneau would bat around the order and score five runs on three hits to go along with two hit batters and a Wartburg error to claim their first lead of the game at 6-3. Working with a three-run advantage, LETU would send starting pitcher Kolbey Sharpe back out to toss a scoreless seventh before leaving a pair of runners on in the bottom of the seventh to send things to the eighth with LeTourneau maintaining their 6-3 lead. Wartburg would be unable to start any kind of rally in the eighth, which allowed LETU to come back up and add one additional insurance run with three-straight two-out singles. The Knights would manage just a one-out walk in the top of the ninth as Wartburg recorded only one hit in the final five innings of play. Sharpe earned his second win of the year to improve to 2-0 while Ryder Lognion picked up save number two of the season with two shutout innings. Cody Lee, Ramirez, and Jones would lead the YellowJackets with two hits each as Lee Hosie would join Ramirez with a team-high two RBI. All 10 of LETU’s hits in the game would be singles, with six of the seven runs by LeTourneau scoring with two outs. LeTourneau will get one more game against Wartburg to close out a three-game set on Sunday, March 17 at 1:00 p.m. The game is part of a run of eight consecutive non-conference games for the YellowJackets that kicked off this afternoon and concludes next Tuesday, March 26. LeTourneau Softball Wins Series Against Belhaven With Saturday Split. LONGVIEW, Texas- Looking for their third American Southwest Conference series win of the year, the LeTourneau University softball team used a 6-0 victory in game one to get the job done before suffering a 6-2 loss in game two to Belhaven University in a Saturday doubleheader at the LETU Softball Field on Saturday, March 16. The split brings the YellowJackets to 13-8 overall and 10-5 in ASC play while the Blazers sit at 7-12 overall and 5-10 in ASC action. A fast-paced pitching duel was seen through the opening three innings of play as just two hits were recorded between the two offenses. The YellowJackets would finally break through in the bottom of the fourth when a sacrifice fly from Macey Mize brought home Kiley Banks who would get on base via a leadoff walk. Two batters later, Ethel Warren would drive in Silver Montgomery from second off an RBI single to left field to make things 2-0 in favor of LETU. LeTourneau would add to their total in the fifth, as Haley Anguiano managed to break for home following a throwdown to second base on a delayed steal by Banks to make it 3-0 while Kennedi Dillow followed things up with an RBI single. 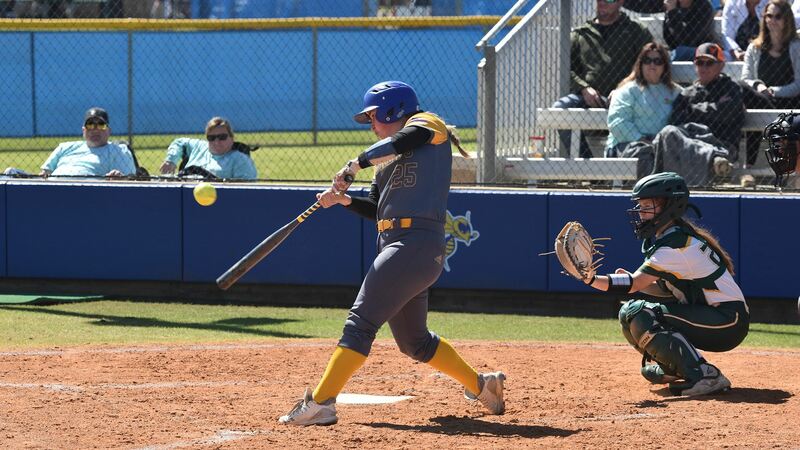 The LETU offense rallied again in the bottom half of the sixth as Katelyn Trombley ripped an RBI double to right center to score Haydn Parker and would later score on a Blazer error. Leigh Luker earned her fourth win in the circle this season for the YellowJackets, giving up just three hits while fanning six batters in a complete game shutout. Parker and Taylor Nichols each had a team-high two hits while three other YellowJackets had one. After a leadoff base hit in the top of the first, Belhaven would be the first to get on the board by jumping out to a 1-0 lead. LeTourneau would look to knot things up in the second as the first two batters of the inning would successfully reach base to set up a squeeze bunt by Maycie Walton that would bring home a run on a Belhaven error. Walton would also end up making it around the bases on the play as the YellowJackets would go up 2-1 heading to the top of the third. The Blazers would benefit from an LETU error in the top of the third, tying things up at 2-2 before tacking on two more runs in the fourth with a two-RBI single. Belhaven continued their offensive surge into the sixth inning, scoring two more runs off three hits and one LETU error to extend their lead to 6-2. LeTourneau would threaten to mount a comeback in the bottom of the seventh by loading the bases with no outs but would see a double play and ground out ended the game without any runs pushed across to allow the Blazers to win the series finale. Samantha Akers took the loss in the circle for the YellowJackets, giving up five hits and four runs in 3.1 innings of work. Warren and Trombley led the LETU offense with two hits each while only three other YellowJackets would see a base hit. Errors proved to the difference maker in the end as the LETU defense had five total errors, while the Blazers limited their mistakes to just two. LeTourneau hits the road one final time in March for an ASC series at Louisiana College beginning at 5:00 p.m. on Friday, March 22. The series will loom large as the YellowJackets and Wildcats are both currently in the top-four of the ASC standings. Collin Jones Finishes Third, Arvin Hrushka Takes Fifth At Abilene Christian Wes Kittley Invitational. 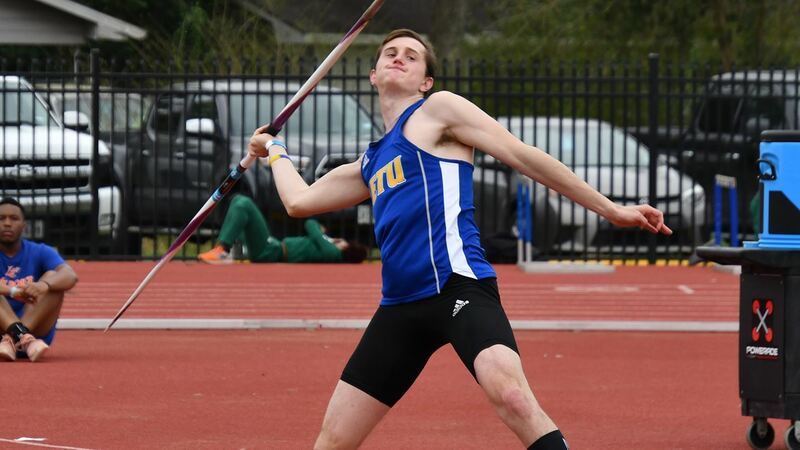 ABILENE, Texas – Competing in the decathlon for the first time this season, LeTourneau University men’s track and field student-athletes Collin Jones and Arvin Hrushka would both land top-five finishes at the Wes Kittley Invitational hosted by Abilene Christian University on Friday, March 15th. Taking third-place with a total of 5,606 points, Jones would finish in third while Hrushka would finish in fifth with a total of 4,899 points. Jones would record marks of 11.26 in the 100-meter dash, 6.02 meters in the long jump, 8.67 meters in the shot put, 1.61 meters in the high jump, and 52.30 in the 400 meters on Thursday afternoon before finishing up his day with five more events on Friday. Hrushka would manage to record marks of 12.15 in the 100 meters, 5.62 meters in the long jump, 10.41 meters in the shot put, 1.82 meters in the high jump, and 54.81 in the 400 meters. Friday’s action saw Jones record with times of 16.99 in the 110-meter hurdles and 5:10.70 in the 1,500 meters while putting up marks of 23.47 meters in the discus, 38.72 meters in the javelin throw, and a score of 4.55 meters in the pole vault. Hrushka would be unable to record a qualified mark in the pole vault, but would record times of 17.96 in the 110-meter hurdles and 4:48.93 in the 1,500 meters to go along with throws of 33.16 in the discus and 32.70 meters in the javelin. LeTourneau track and field will be back in action next Friday, March 22nd when they travel to Commerce, Texas to take part in the East Texas Quadrangular hosted by Texas A&M-Commerce. 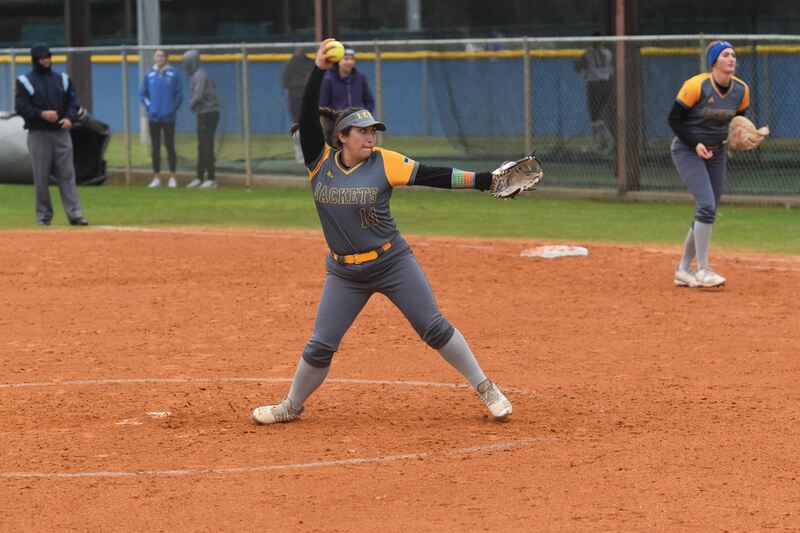 LONGVIEW, Texas – Making the most of three Belhaven errors to score five of their nine runs, the LeTourneau University softball team would grab a 9-1, six-inning victory to open a three-game series at the LETU Softball Field on Friday, March 15. LeTourneau improved to 12-7 overall and 9-4 in the American Southwest Conference while the Blazers fell to 6-11 overall and 3-9 in ASC play. The YellowJackets would never trail in the contest, working around a one-out walk in the top of the first before using a two-out throwing error to score a pair of runs in the bottom half of the inning to go up 2-0. LeTourneau would threaten to add more to their first-inning scoring but would end up leaving the bases loaded after sending eight batters to the plate. All three outs in the top of the second would come via strikeout for freshman Bailey Richey, but LETU would also come up empty in the bottom of the inning before seeing the Blazers use three hits in the third to score one run and cut the lead to 2-1. LeTourneau quickly added to their lead as Ethel Warren would lead off the bottom of the third with a single before a Katelyn Trombley triple would make the score 3-1. Freshman Taylor Nichols would then clear the bases with a two-run homer to left center field to put the YellowJackets up 5-1 as Kennedy Dillow would cap off a five-hit, four-run inning with an RBI triple to make things 6-1 in favor of LeTourneau. The score would remain a five-run advantage for the YellowJackets until the bottom of the sixth when LETU would once again take advantage of a Belhaven error as a leadoff single would be moved to third following a groundout and fielding error to put runners on the corners with one out. Following a pitching change by the Blazers, LETU would see two of the next three batters get hit-by-pitch and would be followed by a walk to drive in a run. The game would end on the next pitch when a wild pitch allowed Nichols to score for the second time in the game and put LeTourneau up 9-1 to end things due to the eight-run mercy rule. Tossing a complete game, Richey picked up her fourth win of the season after allowing just one run on six hits and fanning nine of the 26 batters she faced. Only one inning would feature more than one hit for Belhaven, with the YellowJackets outhitting the Blazers 13-6 and sending 11 more batters to the plate in the contest. Nichols finished her day a perfect three-for-three with a team-high two RBI and two runs scored as five different LeTourneau players collected two or more hits. LETU would also limit their strikeouts to just five in the game while drawing three walks. Both the YellowJackets and Blazers will be back in action for an ASC doubleheader tomorrow afternoon beginning at 2 p.m. at the LETU Softball Field. LeTourneau will look to maintain a perfect 6-0 mark at home this season and will be going for their third ASC series sweep of the year.